The Lehigh football has been in some pretty big time FCS-level atmospheres before. In the FCS playoffs, Lehigh has been to Delaware, Northern Iowa, Towson, and North Dakota State. During the regular season, they’ve also played at Liberty, the Yale Bowl, and James Madison. But as great as those atmospheres were, few gameday experiences can rival being hosted by a team like Navy, with its traditions, its sea of white-clad Midshipmen, the playing of the alma maters after the game. 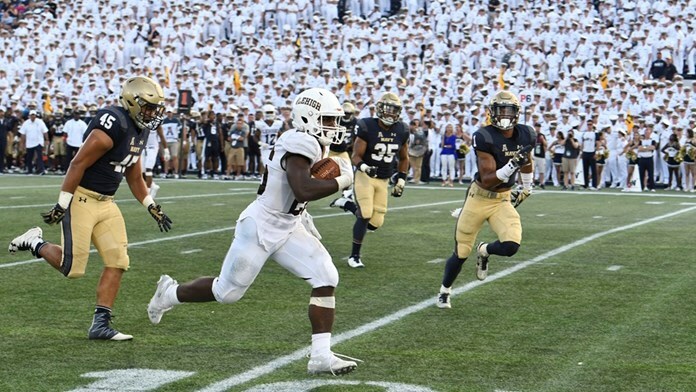 So though the final score was somewhat lopsided in a 51-21 defeat for the Mountain Hawks, there was plenty of good things to take away from Lehigh’s first game against an FBS school in fifteen years. Start with the play of freshman RB Rashawn Allen, who, subbing for the injured Dominick Bragalone, had a breakout game against a team that knows a thing or two about rushing the football. His 147 yards and 2 scores – one of 75 yards and the other of 26 yards – were beautiful pieces of running. HE. IS. OUT. OF. HERE. Allen’s spectacular plays came in between some brutally effective speed-option running by Navy. QB Malcolm Perry ran 19 times for 223 yards and 3 touchdowns, while WR Zach Abey, RB Myles Fells and QB Garret Lewis all added touchdown runs of 1, 52, and 4 yards respectively. A recipe for an FBS upset involves winning the turnover battle, and Lehigh’s offense gave up the ball in a multitude of ways. Three interceptions, many of them on tipped balls, and some untimely fumbles were a killer to any chances of an Appalachian State moment in Annapolis. It was in that spirit that the Mountain Hawks seemed to take this game – a guidebook for where they want to go this season and beyond. On defense, it showed the level of consistency they need to bring to their Ivy League and Patriot League games to have a successful season. On offense, it showed what was working, and what still needs work. But it also was the experience of a lifetime for the Lehigh football players as well.